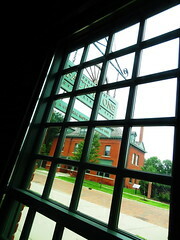 Today we are about 66 miles northwest of Detroit in the city of Flint MI for the Be A Tourist In Your Home Town event. You have undoubtedly heard of the water crisis that started in 2014 and is still ongoing. Progress is being made; the city is back on the Detroit water system, lead pipes are being replaced, water is being monitored closely; it’s a process. 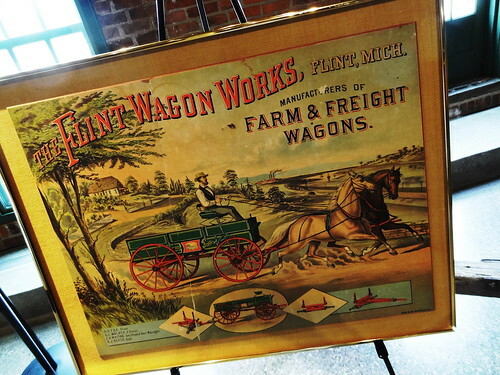 A century and a half ago Flint was a center for the lumber industry, revenue from lumber financed the local carriage-making industry. As horse-drawn carriages were replaced by automobiles, Buick, AC Spark Plug and Chevrolet all took up residence here. 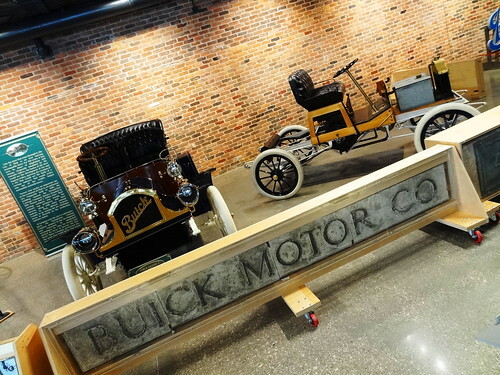 By 1908 Buick became the largest manufacturer of automobiles thanks to William C Durant, founder of GM. The city thrived, beautiful buildings sprouted downtown, lovely neighborhoods were built. Then as it often happened to industrial cities, factories closed, moved away, jobs left; Flint was devastated. Today manufacturing still leads employment with medical and education not too far behind. 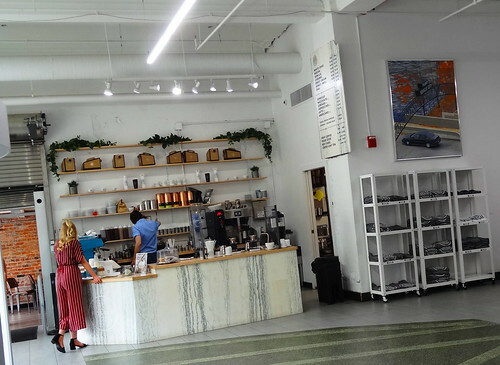 These days the city is reaching out to the youth who attend U of M Flint, Mott, Kettering and Baker, making it more appealing for them to stay put with a revitalized downtown that includes new retail, coffee shops, cafes, trendy restaurants and breweries. We’re excited for the opportunity to show you the positive side of Flint. We purchase a wristband for $1 each, this gets us into historic buildings, bus tours and cultural institutions; a program lists attractions, participating restaurants and bus routes. The 7-story Ferris Wheel Building is our first stop, built in the late 1920’s the Art Deco structure was the home to Pringle Furniture, Gainey Furniture and most recently Ferris Bros Furs; hence the name. 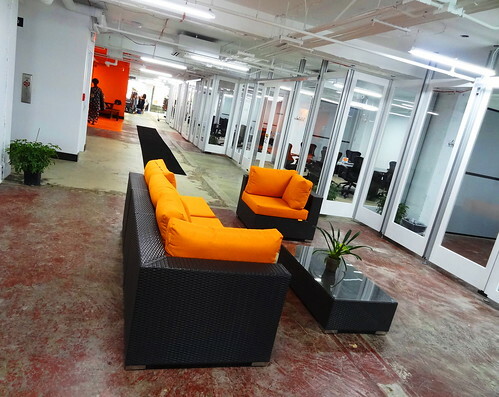 At approximately 40,000 sq. ft. the building has been vacant for nearly 40 years. 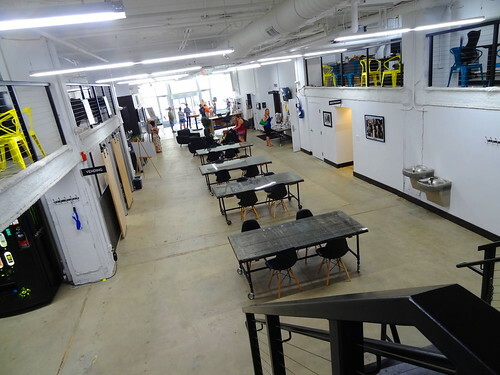 Now a shared workspace, the building is home to entrepreneurs, inventors, small businesses, a community meeting space and event venue. 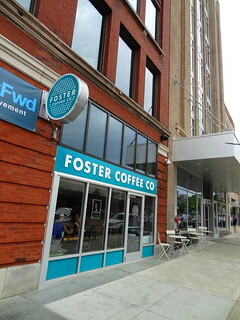 Foster Coffee Company is located on street level in what is basically the lobby of the building, a large seating area fills the main floor of the adjoining building, tables and counter seating along the front window are in the Ferris space. 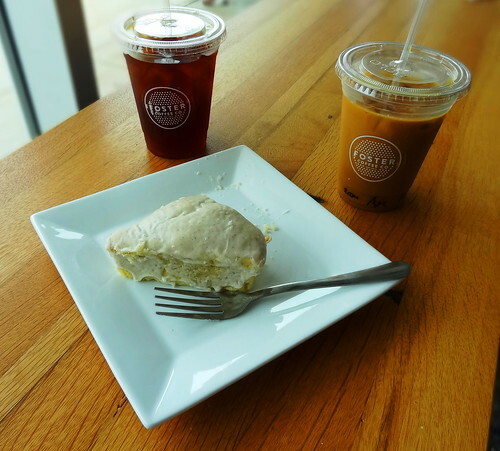 We order a couple of cold brew coffees, choose a vanilla bean scone and take up residence in the front window; the scone is outstanding and pairs perfectly with the rich, smooth coffee. Kris gets up and takes photos while I peruse the program, there’s a ton of things to see and do! A guided tour through the building is about to begin, we join the group. 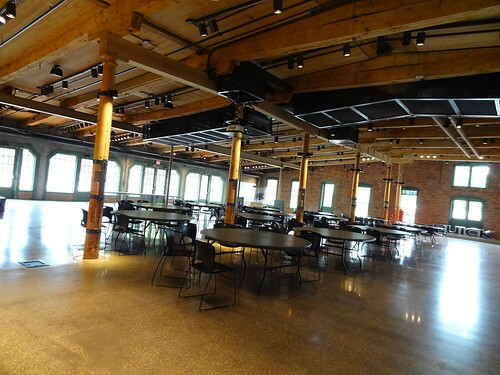 Everything is painted white as far as I can see, work tables and lounge areas are scattered throughout the main floor, black and white photos show the building when it was the fur company, Flint-centric items connect the past to the present. 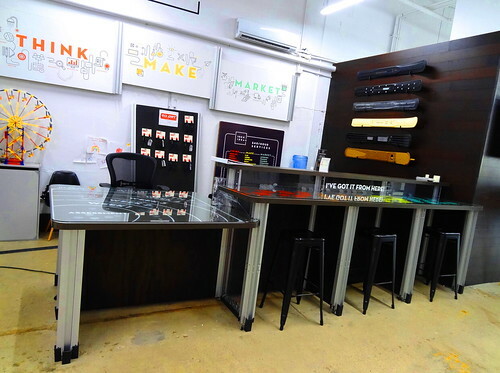 The office of 100K Ideas is to the right, they offer budding entrepreneurs guidance and assistance to take their business from ‘napkin sketch to prototype’, a few examples of success stories are on display. 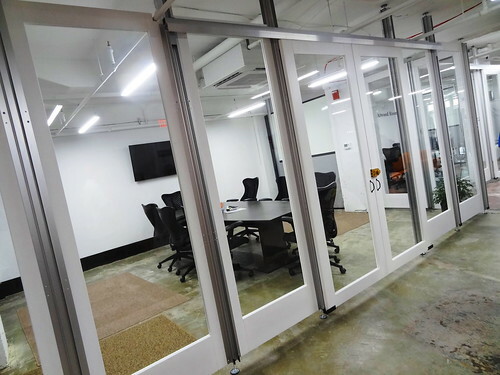 The tour moves upstairs, adjustable glass panels and doors allow tenant space to be reconfigured as needed, rent is paid on a month to month basis, if you don’t need an office you can just have access to the work areas for a smaller fee; currently there are over 40 members of Ferris Wheel. Up a couple of stories floor to ceiling windows provide a panoramic view of downtown, cozy seating areas are set up near front and back windows creating a waiting area for potential customers; a community kitchen is on each floor. There’s a bit of a buzz on this floor as models race to and fro preparing for a fashion show. We take the stairs back to the mezzanine level overlooking the main floor, a new group of tourists has assembled in the lobby. It’s good to see so many people out exploring today. A short walk down Saginaw St. is Cafe Rhema, they are participating in today’s event with a discount for ‘tourists’, it’s lunch time so let’s check it out. 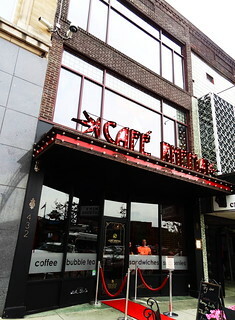 This is the former Economy Shoes building, it was the first building to be renovated in the downtown area; there’s a small marquee on the front of the building with the name of the cafe spelled out in free-standing letters above, velvet ropes and a red carpet lead us to the door. 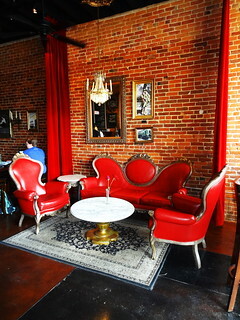 Inside it looks like a place right out of the Roaring 20’s; charming seating areas have antique furnishings, vintage lighting, black and white photos complete the decor, it’s so pretty. 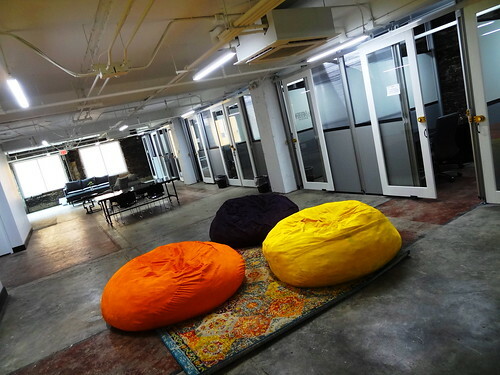 The cafe serves craft coffee and espresso drinks, bubble tea, baked goods, sandwiches, salads and waffles. 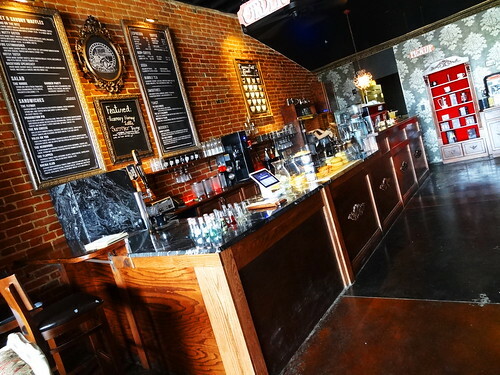 We order at the counter, employees are dressed in period clothing–think Great Gatsby, very cool. We sit at a community table with other couples also doing the tour today, we talk about what we’ve seen so far until the food arrives. The Puttin’ On The Ritz waffle is baked with apples and cinnamon, topped with whipped cream and maple syrup, it’s really good. 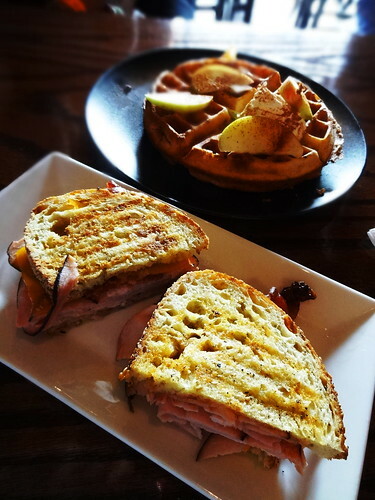 The Prohibition Pig is a panini with honey-roasted ham, bacon, house infused bourbon bbq sauce, cheddar, sweet and spicy mustard on bread from Crust Bakery in Fenton, delicious! On our way out we stop at the counter again just to check out the desserts, they look amazing but we can’t eat another bite. Kris notices the taps, one says Espresso Root Beer, the other Brown Sugar Bourbon, turns out they make their own soda pop too. We try a sample of each, they’re excellent. 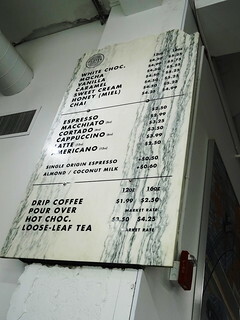 The cafe is one of those really unique places you feel lucky to have found; from the staff to the menu to the decor, everything about it is well done. 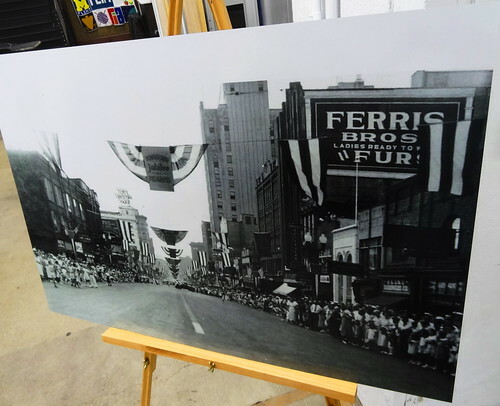 We walk through downtown, cross the Flint River on a pedestrian bridge to Carriage Town; this is where the automotive industry got its start in Flint. It’s funny how things come together. There were men with ideas, movers and shakers; Durant, Dort, Louis Chevrolet, David Buick, Alfred Sloan. 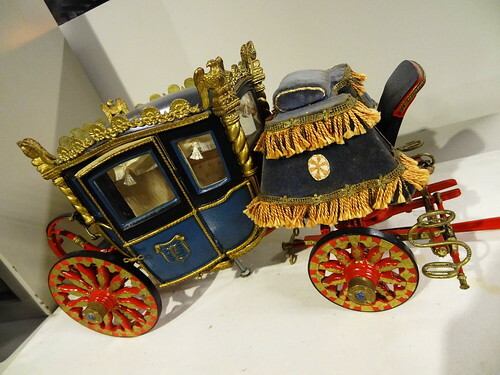 The Durant-Dort Carriage Company, founded by Josiah Dallas Dort and William Crapo Durant, became the world’s largest volume producers of horse drawn carriages, which eventually evolved into automobiles and from all of this General Motors was born in 1908. Ok, that’s extremely simplified but you get the picture. We have arrived at General Motors Durant-Dort Factory One, it’s open to visitors today, let’s see what it’s all about. 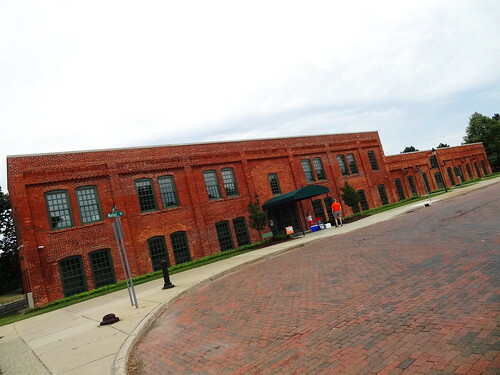 Originally established in 1886 as the Flint Road Cart Company, this historic Flint GM plant is referred to as the American automakers birthplace. 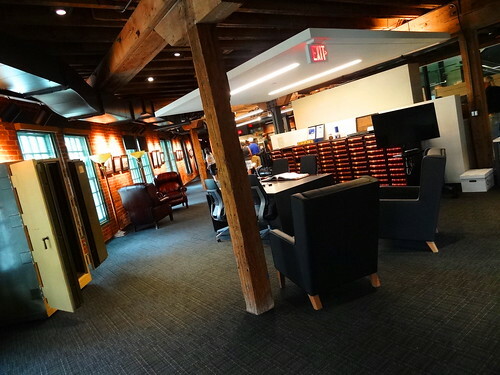 The red-brick building has been completely restored; it’s now home to the Kettering Archive Collection which contains about 100,000 historical documents, photos and artifacts related to Flint’s GM history and the Factory One Conference Center. Statues of Dort and Durant stand close by, keeping an eye on things. A National Park Service sign in the lobby dedicates the building as a Motorcities Automobile National Heritage Area, a volunteer shows us which way to go. We’re in a large museum-like room, there’s a lot to look at. 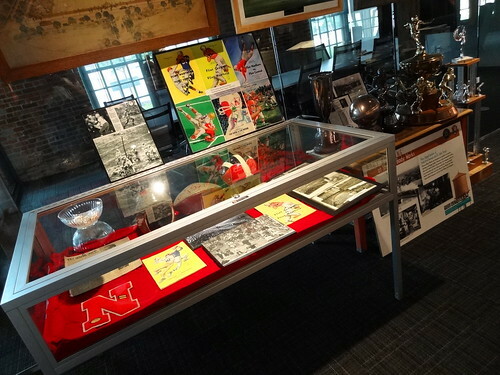 Glass cabinets display Flint football memorabilia; programs, trophies, a football and a varsity letter. 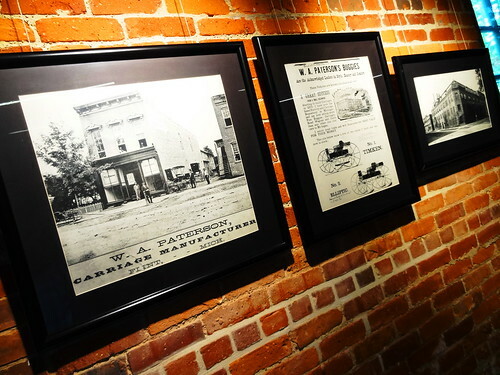 Framed black and white historic photographs of factory buildings, people and advertisements hang on exposed brick walls. 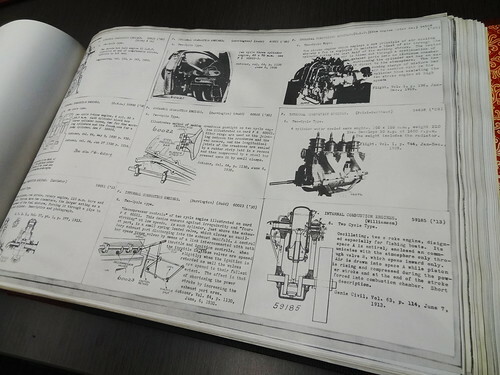 A small collection of items belonging to David Buick are grouped together, antique automotive parts and modern pieces sit side by side, vintage advertisements rest on easels. In the reference area leather-bound manuals fill bookshelves, they even have the mini-carriage used for the Fisher Body logo–next time you’re in the Fisher Building in Detroit look for the logo. In the conference center you really get a feeling for the age of the building, look at those original wooden beams; much of the original structure still exists. Beautiful antique automobiles take center stage, I like the white wheels and tires on the midnight blue Buick, I’m happy they saved the original stone lettering from the Buick factory. You had to have lots of windows to let sunlight in back in those days, the whole room is awash in natural light. A short film is about to start, we take seats at round tables to watch. The film takes us through Flints early days as a mecca of the wagon industry, how David Buick’s plumbing expertise helped him to design his internal combustion engine, how Durant bought up several automakers and brought them together under GM, did you know he lost GM not once but twice? Every time I watch a historical film like this my mind wanders to the local road names, I say to myself, oh, that’s where Dort Hwy came from or I didn’t know there was really a guy named Chevrolet. History is fascinating and we’re having fun at the same time.